As Mr. Toda took his leave, the program continued on the theme of talent management. 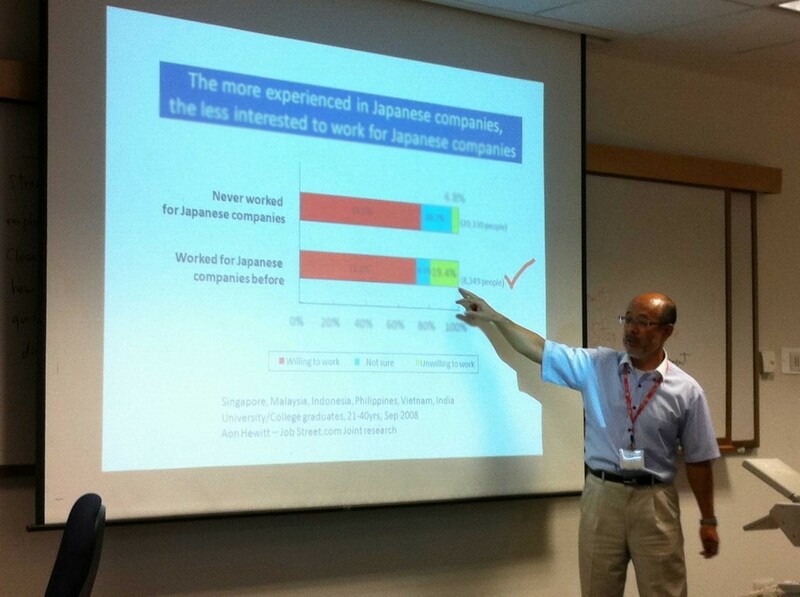 Prof Ohtaki (left photo) quoted a survey done by JobStreet.com (which he is a consultant for, one of Singapore’s major online job search portals ) on the issues of speed of promotions, job-hopping, work-life balance, career aspirations and expectations, and also the keen interest of Singaporeans to be their own boss one day. This is in contrast with the Japanese concept of employment, which places an emphasis on loyalty, slow promotion, a more equitable rate of compensation, and also the desire to work for a big company. Noting these differences, Prof Ohtaki urged the Waseda students to think about such issues when managing local staff, so that both the company’s expectations and staff expectations can be aligned and met. After lunch, the group hopped on the bus to meet Mr. Koike, CEO of Cerebos – a leading Japanese firm in the area of food and health supplement, at a five-star hotel in town area. A winner of the Best CEO of the year 2010, Mr. Koike is a very charismatic person, as he touched on the key points of why Cerebos succeeded in Singapore. Having worked in Wall Street and speaking in fluent English, Mr. Koike talked about how Cerebos prefers to manage the future by creating it. It was a very inspirational talk, as Mr. Koike talked about how Cerebos aims to be a Best Practice company and benchmarks itself against competitors and other market leaders. Thursday morning featured a discussion of talent management in Singapore with the Waseda students. The current cohort of Nanyang-Waseda Double MBA students is comprised of five nationalities: Singaporean, Filipino, Thai, Indian and Korean. This provides an insight as to how we perceive working in Japanese companies and what endears us or not to them. In the afternoon, we made a trip to the Panasonic factory at Bedok. The factory is huge and full of heavy machinery. Panasonic has set up its manufacturing operations in Singapore for many years, and it has an extremely high standard of quality control. It also places a high emphasis on Corporate Social Responsibility, as it recycles materials and adopts eco-friendly practices, even at the cost of decreasing profit margins. After the factory visit, I joined the “marketing” group of the Waseda students to discuss on the presentation for the next day. It was during this discussion that I have learnt plenty from the Waseda students, in an attempt to summarize and crystallize the learning and content for the past few days. Friday concluded with group presentations and the summary of learning. The final group was definitely the most entertaining, as they acted out a skit as part of their presentation. The acting was very amateur, but it got the whole class laughing and a perfect end to an intensive five-day of seminars and company visits. I joined the intensive program without knowing what to expect. I received an email from Yajima-san, and decided to make the best out of it by attending all the classes as long as they do not clash with my core classes. The first day of the program caught me by surprise, as I soon realized that everything was conducted in English. As you know by now, that the intensive program is created with the goal to expose Waseda students (typically Japanese) to Japanese companies operating in a global environment, and with this, the entire program was conducted in English – to expose them to the language and the ‘global’ environment feel. That, of course, made life a lot easier for me, but not so for the Waseda students. Prof Ohtaki is very determined to make this part of their experience, to take them out of their comfort zone, and let them experience and think about what it is like to be a Global Business Leader. The next session was with the head of SBI Venture Capital, Mr Takayanagi. I was really impressed by Mr. Takayanagi’s credentials who earned his degrees from Oxford and Harvard. It made me think hard about what attracted him to work in Singapore, and not other cities, which he made is clear during his talk – Singapore is an ideal location to do business. I had mixed feelings on Wednesday listening to Mr. Toda from Yamato transport. I am a big fan of Kuroneko, having used their immaculate services extensively when I was in Japan to bum around. I later thought of marketing their services on my Facebook, in hope to raise awareness of their company and services. What caught me by surprise was that two of my friends related their bad experience with Kuroneko, telling me a similar story line: the parcel did not get delivered, and nobody at the company could give a satisfactory answer. This is seriously bad for a delivery company that prides itself on customer service and timeliness. I look forward to talk to Mr. Toda when things settle down a little more during my trimester to see if I can help with developing the local market. Later in the afternoon, we had our “Brand’s Essence of Chicken” Seminar with Mr. Koike, CEO of Cerebos. I was caught by surprised that despite Cerebos being a company bought over by Suntory, the Japanese have not heard of “Essence of Chicken”. As expected, when they consumed the bottle of “Essence of Chicken”, they thought that the taste does need some getting used to. This definitely explains why it is not more widely consumed in Japan. What really inspired me is how Koike adopts a proactive and visionary approach to his company and his personal life. He is one person who will forge ahead regardless what the environment or norms dictate what he should do. This strong belief underlies Mr. Koike’s leadership style and quality. The visit to the Panasonic factory was an eye-opener for me. I soon realized that work in a factory is a very tough job. The CSR Manager explained to me about how they take pains to recruit, and how Singaporeans will shun the job because it is really very demanding. Thanks to the loose foreign workers policy, they are able to train and posses a very high quality team of workers. They also implement cross-training for their workers to make sure that people can be flexible to work at different stations if somebody falls sick. Do you know that Panasonic makes so many compressors that you can find them in almost any brand of refrigerator that stands in your kitchen? The original equipment manufacturer (OEM) business is not very profitable, but it keeps the company going. What really struck me is Panasonic’s persistence to quality over profitability. 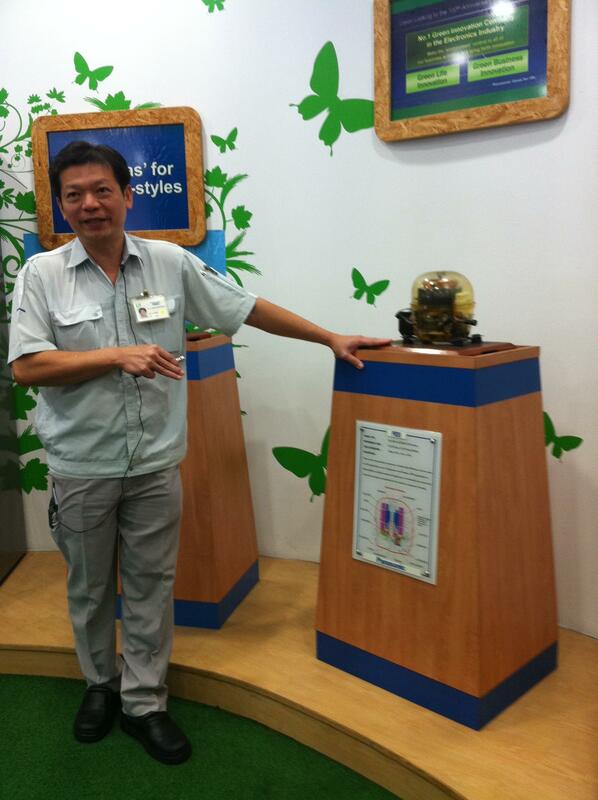 They aim to produce the best products in the most socially responsible manner with less emphasis on profit margins. This is a common theme for Japanese companies, and I feel the world needs more of it. As I left Panasonic, I witnessed a scene of flag-raising at the factory. It was a touching moment, as I looked up into the skies and starkly recall my sense of heritage as a Singaporean. Thereafter, I joined one of the groups for a collective discussion for the following day’s presentation. I was very impressed by the analysis and professionalism of the Waseda students, and had a very good learning experience. Despite knowing Singapore reasonably well, I am constantly surprised about how little I know of the country when trying to answer the questions asked by the Waseda students. Learning and having fun alongside the Waseda students, forging precious friendships…….this is a summer course that I will never forget and I am thankful that we have such wonderful opportunities in the Nanyang-Waseda program.